to August 2017, along with outcomes of those activities. The NHS Cervical Screening Programme saves an estimated 5,000 lives every year in the UK and provides the best protection against cervical cancer. However attendance of this life-saving test is at a 19 year low and incidence of cervical cancer is worryingly high with nine women diagnosed with the disease every day in the UK. In 2015-16, only 72.7% of eligible women in England attended cervical screening when invited. This figure masks dramatic differences in coverage across the country from just 55.5% of eligible women in Kensington and Chelsea to 81.4% of eligible women in South Gloucestershire. 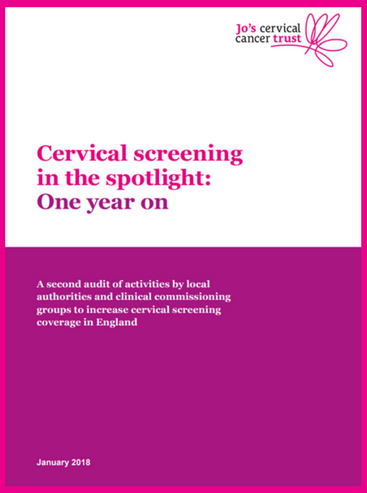 This report summarises new research into the activities undertaken by local authorities and clinical commissioning groups (CCGs) across England to increase cervical screening attendance. Despite the need to improve screening accessibility, provision through sexual health services has dramatically fallen in some areas resulting in reduced access to potentially life-saving cervical screening. The full report features case studies of CCGs and local authorities utilising the resources available to them and working in innovative ways to increase attendance. Cervical cancer can be prevented and GP surgeries, Local Authorities, CCGs and the four UK Governments all have a key role to play in increasing awareness of cervical screening and encouraging women to attend this potentially life-saving test. We have specific information and resources for health care professionals to use to encourage attendance here. If you have a cervical screening project which deserves recognition, enter our Cervical screening awards!